Best known in the U.S. for its hard rock material, Golden Earring has been the most popular homegrown band in the Netherlands since the mid-'60s, when they were primarily a pop group. 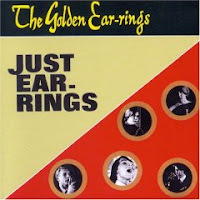 This fine review from Allmusic says it all, here: Long before Golden Earring were an international act, they were a typical Continental beat group, billing themselves initially as "The Golden Earrings." Their 1965 debut was a lightweight but enjoyable effort, highly derivative of British beat circa 1964-1965, especially the Beatles, the Kinks, and the Zombies; all but one of the tunes were original compositions. Bueno aca va algo de lo que algunos consideran como rock garagero de los 60s, con mucha mezcla de rock clasico, algo pop y hard tambien. Mas que recomendado este 1er album de una extensa discografia de la banda que se extiende hasta los ultimos años. Muy influenciados por la invasion britanica, Zombies, Kinks entre otros. Bueno este disco no es tan aspero y crudo a comparacion de otros, matices mas elaboradas, pop con rock clasico hacen de este album muy interesante de escuchar. On stage this band was really wild, the girls go nuts with their songs, hairstyles and that shake on thing that they used to do on stage. Yes, inspired by the early brothers of the area, Jaggers, Sonics and a lot of bands of the States. The band was heavily influenced by The Yardbirds, Cream and of course, The Who. You ll have here a good dose of classic-wild garage, a great version released by Sundazed a few years ago, try to find it if you can. Aca va algo, mientras que el Dr esta viajando, espero que esto sea de su agrado, ya que tengo indicaciones especiales de el de postear cosas garageras, jaja no mentira. 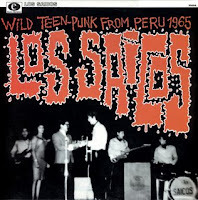 Bueno, volviendo a lo que nos concierne, aca van 4 singles de esta espectacular banda de San Jose, con claras influencias de los Cream, Yardbirds y por supuesto, no podian faltar los Who. A tener en cuenta, que aca va una dosis garagera en mayor dosis a pesar de la cantidad de temas, son 4 temas en los cuales no bajan los decibeles en ningun momento. Dosis de psicodelia en menor proporcion y fuzz en menor aun, pero aun asi rabioso y acelerado. I'm about to begin my move back to the other side of the world. This means that I may not be able to post anything for a bit. I'll be in a groovy Japanese business hotel for a week or so. If it has decent wireless, I may actually end up posting a lot though the veil of bordom, but I won't know until I'm there. Anyway, I will be back and maybe Pablo will check in with a couple of rockin' garage posts in the meantime. See you soon! Usually an odds and sods compilation is simply a nice bit of musical archeology for an artist. For the Millennium, however, these late 60's recordings are absolutely essential. As a functioning band, they only managed to release one album, although I consider it to be one of the best ever, so anything else of their's that we can scrape together deserves at least my rapt attention. 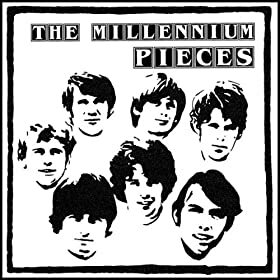 The guiding light of the Millennium's Begin album was very clearly producer and vocalist Curt Boettcher, but this disc shifts the focus to some of the other exceptionally talented band members like Sandy Salisbury, Joey Stec, and Lee Mallory. In full disclosure, this compilation doesn't even attempt to match the amazing vision of the Begin album, and there are definitely a few bland tracks present here, but the bulls eyes are absolutely phenomenal. There are a couple demo-quality renditions of tracks from Begin, but I don't consider those to be much more than a fleeting curiosity. Where this disc really shines is in some of the outtakes and tracks earmarked for the band's never realized second album. In this category is the blast of country-tinged sunshine psych "I Just Don't Know How To Say Goodbye," the truly groovy "god People," and "Suspended Animation," which managed to realize the tag of 'cosmic American music' in a way that neither Roger McGuinn or Gram Parsons quite managed. In general, the tracks here veer a little more into the country rock territory than the band's earlier recordings do, but when it gets matched with a fully realized sunbleached Boettcher production, the results are truly magical. This is not where you want to start with the Millennium. The Begin album gets my absolute highest recommendation, but I promise that you'll be thirsting for more, and this is the best place to look for it (along with Sagittarius' Present Tense). 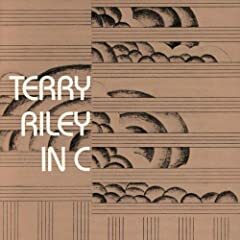 One of the seminal minimalist works, Terry Riley's "In C" is much more open to interpretation than most compositions. The music is simply a set of charted instructions that give each player a basic phrase to play for an indeterminate period of time while a pulse continuously throbs in the background. The instrumentation and length of the piece is completely left up to the musicians to decide. As such there are many very different sounding recordings of this piece, but today we'll be looking at the first album featuring the piece along with Mr. Riley himself as part of the ensemble. This version is played by a relatively small group of about ten musicians. It's a little sparser than some later recordings, but certainly has no problem creating the hypnotic vibe of the music. Running here at 42 minutes, "In C" either requires your complete attention or to float around in your subconscious as truly psychedelic background music. The motifs and tonal colors slowly shift although there is little melody for the listener to latch onto. The also great "A Rainbow In Curved Air" almost seems like bubblegum pop in comparison with the theory-guided tapestry of I consider this one a strange and alien musical world that is very worth exploring. Detached from the normal realm of compositional logic, his could be the blinding light that helps lead you into aural enlightenment if you're able to stand the glare. If you happen to find yourself enjoying this, you may feel compelled to make a little side hobby of the very different renditions of this piece. With hindsight clear in the rearview mirror, Riley participated in a recording of this 25 years later with a much larger ensemble in a recording that is well worth your while. There is also a very different post-rock injected 2001 recording from Bang On A Can that cast the music in a very different light. There's probably no better place to start than the source, though, and this is it. Ah, you couldn't possibly go wrong with a name as oddly lysergic as "Skip Bifferty," and fortunately this release doesn't prove me wrong. 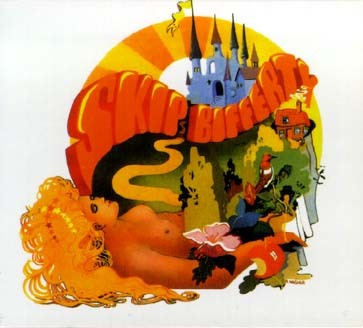 Although the fairy-tale cover suggests a very twee psychedelic album, Skip Bifferty goes for a somewhat grittier sound. Their instrumentation deviates a little from the norm, with the backbone of the sound being compressed drums, throbbing bass, and piano, on top of which the group slathers on some fine harmonies. "Money Man" is a strong, catchy lead off track that sets the tone pretty well for the rest of the album with the piano based sound, super harmonies, and a few well placed sound effects and sparing fuzz guitar. Yet the best track, "Guru," veers off in a very different direction. The tune only features vocals and a wall of percussion, but is so well done that it deserves a spot as one of the best U.K. psych tracks to show up in 1968. It a little like The End's "Shades Of Orange," but arguably even better. "When She" features an almost Black Sabbath-like melody, but it's like Ozzy's crew recast as piano pop, if that makes any sense. "Prince Germany The First" is another piano pop standout. For a more filled out band sound, head for the great "Jeremy Carabine," "Time Track," or the awesome bouncy guitar riff and choir-boy vocals in "Gas Board Under." If I may, I'd like to sketch out a couple reservations that keep me from really loving this album. It's some of the same things that keep me at a distance from the Small Faces, and indeed that legendary band produced "Man In Black," Skip Bifferty's final single. While the production is generally very well thought out and interesting, when the band thickens up the sound, it's a little muddy and messy sounding to my ears. The best sounding songs (as in not the actual best) here are the more sparsely arranged ones. Like Steve Marriott in the Small Faces, Skip Bifferty possessed a fine vocalist with a voice perfect for Rhythm & Blues wailing. Unfortunately, I don't feel that such assertive vocals work so well in the realm of psychedelia. Graham Bell may be the superior vocalist here, but I tend to prefer it when the other fellow sings lead, just like Ronnie Lane taking the lead vocal duties form Steve Marriott. I sometimes have the same issue with Steve Winwood's vocals on the early Traffic recordings. My personal definition of prime psych vocals include a slightly detached sound and not the fully engaged howling of a R&B vocalist. The bonus tracks here are basically a clearing house for the band's singles. We find the harder rocking "On Love," where Bell's vocals really shine, matched with "Cover Girl," which seems to be trying to convert "God Rest Ye Merry Gentlemen" into a rock song. There's also the Small Faces collaborated "Man In Black," and the truly strange "Schizoid Revolution." This eight minute number starts of as an organ coated psych rocker before descending into an insane black hole of sound that sounds like the Red Crayola's first album. 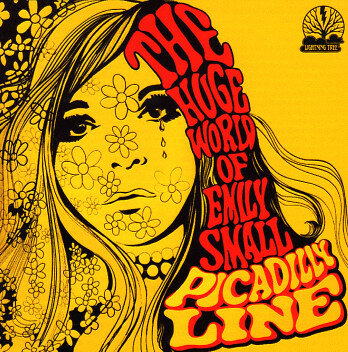 Picadilly Line's sole album is a textbook example of psychedelic pop, with a strong emphasis on the pop. I guess that the music tends to slip into the "toytown" subgenre that ran rampant through the U.K. in 67-68, but I find this music far more palatable than the average stuff in that classification. I think that's because whereas the typical British group of the period reaches back to music hall traditions for their whimsy, Picadilly Line opt for a more folk-ish style of song with some very Simon and Garfunkel like harmonies adorning the music. It's more like gauze for the ears than the syrup that you get with a band like Nirvana (the 60's British band, of course). The songs on the album are strong throughout the album. The opening title track is a fine number that seems to suggest the opening of a concept album, but as far as I can tell the other songs are more of a collection of "could-have-been" singles than having any conceptual link. Really, the entire first side of the album presents us with a string of mildly folky psych pop numbers punctuated with some chamber orchestration (y'know, the 90's tag of 'chamber pop' could easily apply here). The band maintains a very consistent quality level, but if you want a highlight, I'd go for "At the Third Stroke." "Gone, Gone, Gone" picks up the volume level a touch, but it 'rocks out' in the same way that the afore mentioned Simon and Garfunkel might have. With the second side, the band throws in a touch of Dylan influence. This is obvious from their groovy cover of "Visions Of Johanna," but I can hear it in the phrasing for a track like "Tumble Down World" too. My copy of this isn't really clear where the bonus tracks begin on the disc. As I said, if there was supposed to be a concept, it didn't really work out and my liner notes are all in Japanese. I'm going to assume that "Rosemary's Bluebell Day" starts of the extra content as the production sound is different and it sound tailor-fit as a lost psych single. It's also one of the best tracks on the disc with a fine chorus and a killer bridge. I'm not sure if the bonus tracks, precede the proper album, follow it, were plans for a scrapped second album or what. I'm thinking secong album as the production is a little less clear and goes more for a wall-of-sound aesthetic. The orchestration is also a great deal thicker that the delicate chamber stuff from the proper album. "Yellow Rainbow" is another bonus standout with a touch of a raga-rock vibe thrown in, and even a some slightly fuzzed guitar. This is a very poppy album, but one of the better ones I've heard from the U.K. I'd rank this just a touch below the classic Hollies albums from the same period. You're not going to freak your mind into the 7th dimension with Picadilly Line, but you will get some top rate harmonies, songwriting, and chamber sounds. Ok here whe have one of the most influential bands of all the time from Peru. Yes, a lot of bands started after they disbanded, bands like Pax, Miguel el Humo, Traffic Sound and others. Yes this albums sounds almost dark in a couple of songs, the band perfomed as their were going to die in any moment ! Really hard, their sound is unique, in some ocassions, similar of the early Wailers sound, or some Trashmen alike. 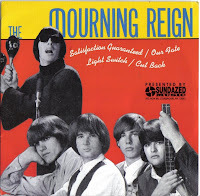 Their early recordings are from 1964-1965, the band never released an official album, instead they released six 45. The members of the band said that they left the band in order to have a "normal life". Some acid days, smoking days, non sleeping ones too. So here we`ll found some fuzz garage and raw songs. Plus this album contains of the heaviest songs recorded in Southamerica , "Demolicion". Here you have a great introduction to know more about some Southamerican Classic & unknown Garage. Una banda que fue una de las primeras en realizar grabaciones propias en la epoca (1964-65) y tambien estaria entre las primeras que realizaron grabaciones en español, claro me refiero a las que tuvieron mayor suceso comercial obvio.Aca en el disco se nota la clara influencia de los Beatles, Ventures y por momentos de los Wailers. La banda nunca grabo un disco oficialmente, solo llegaron a lanzar seis lps de 45`. La banda se separo oficialmente en 1966 para poder continuar con una "vida normal".Si, es verdad... varios nos emocionamos cuando vimos a Erwin subir al escenario para poder frasear la letra de "Demolicion" hace un par de años atras,ya que nunca se supo nada de la banda hasta el 2006 cuando les realizaron la entrega de una placa y un acto conmemorativo por haber sido una de las primeras bandas mas importantes en Perú. This album is not really a band at all, but rather a front for legendary producer David Axelrod. Apparently his manager got an urge to fabricate and promote a non-existent group, and Axelrod got stuck with throwing the music together with the help of his lyric-writing son. Right off the bat, this is not prime Axelrod, but it does have a few things going for it and a few sonic curveballs. At this point in time, Axelrod decided to temporarily head in a direction influenced by Spanish music, and instead of screaming fuzz guitars, we hear plucked classical guitar runs (along with some great electric 12-string too). Unusually for 60's Axelrod, there is no orchestra adding exclamation points, and instead the crack session players sketch out the Axelrod signature orchestra hits. And yes, the bass and drums remain damn funky and have probably already been sampled 683 times. Then there are the aforementioned curveballs. This is a much poppier album than is usual for Axelrod with the vocals front and center and the whole thing reeking of a late 60's folk-rock vibe. For better or for worse, the album only manages to do this on an average level. Of course the arrangements are interesting, but the melodies jsut don't make much of an imprint here. Maybe Pride didn't need Michael Axelrod to write lyrics. The vocals, done by a fellow record producer, are pretty anonymous and I could just as easily take this one as an instrumental. Pride is really a curio for those who are already David Axelrod fans. I can recommend it in that it warps some signature sounds and production tricks of Axelrod's, and casts them in a very different light. Viewed simply as an album, though, there's nothing here that's going to rock your world. Usually I prefer original albums to compilations, but Melts In Your Brain... Not On Your Wrist is not only a definitive document of what is arguably the best American garage band, but rights some horrible wrongs perpetrated by the band's producer and record label on the original LPs. 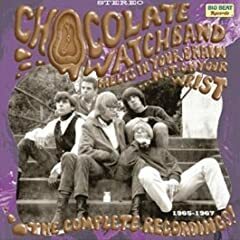 You see, along with the Electric Prunes, the Chocolate Watchband is a quintessentially infamous example of a very talented band getting used and abused by the record industry. None of the original albums (No Way Out, The Inner Mystique, and One Step Beyond) featured the classic line-up for the length of the whole album. No Way Out contained a few authentic Chocolate Watchband, although producer Ed Cobb altered many of the band's performances with pointless overdubs or by replacing vocalist David Aguilar with the fine, but superfluous Don Bennett. Since the proper band had long since split up by the release of The Inner Mystique, we find four outtakes of the band along side recordings by completely different groups (although still credited to the Watchband. One Step Beyond does feature the same group for the length of the album, but it's a reconstituted band with a different line up that doesn't hold a candle to the original. Fortunately, this wonderful set gets everything in order by throwing all of the untainted Chocolate Watchband tracks on the first disc, and getting all the random surgery jobs and different bands on disc two. As such, disc one is the main event here. The music plays pretty well as a collection (marred only by the fact that the compilation producers left in some studio chatter and false starts), and finally gives us a full image of the greatness of the Chocolate Watchband. The band wails away relentlessly, channeling a mildly psychedelic mid-60's Rolling Stones' groove, although unlike most band influenced by the A-listers, the Watchband often sound possessed in a way that even the Stones never managed. David Aguilar sounds an awful lot like Mick Jagger on the surface, although he also comes across as way more wild and out of control. The Dylan cover "Baby Blue" sounds like a prime outtake from Aftermath, although I doubt that even the Stones would have managed to rip this one apart quite as convincingly. While we're on the subject, "She Weaves A Tender Trap" sounds like the best song that wasn't on Between The Buttons. They also managed to show the Yardbirds up on "Sitting There Standing," where guitarist Mark Loomis pounds the great guitar riff even farther into glorious raunch than Jeff Beck could. I'd be amiss not to mention the band's prime nuggets, "Let's Talk About Girls" and "Are You Gonna Be There (At The Love-In)." "Love-In" sounds great as always, but "Let's Talk About Girls" is even better as David Aguilar finally gets his voice on the track. He had to record the vocal in 2005, but I have to admit that I would not have noticed if it hadn't been touted as such in the line notes. Other highlights include the truly weird surf rockin', Zappa anticipating "Loose Lips Sync Ships," the face pounding "Medication" (also with a 2005 Aguilar refit), and a couple more covers that are better than the originals with "I'm Not Like Anybody Else" and "I Ain't Know Miracle Worker." Nothing on this first disc is bad and it's one of the best hours of prime garage psych that you'll find anywhere. Disc two compiles everything erroneously credited to the Watchband. When on the proper albums, this stuff does nothing but breed contempt as we're not hearing the proper band, but given room to breathe here we find that much of it is quite good. The first eight tracks are the tunes manhandled by Ed Cobb. We find Don Bennett begin brought in to replace Aguilar on several tunes. He's not a bad singer at all (except when parodying Aguilar on "Let's Talk About Girls"), and adds a little big city soul to the sound, but when replacing a great singer that fits into the group's sound like a glove, hearing Bennett on the original LP is more than a little disconcerting. As alternate versions hanging out on a second disc, it's pretty enjoyable. There are also tracks with additional overdubs, such as the ones on "Baby Blue" which almost manage to bury the superior original track. Cobb seemed to have a thing for crappy, atonal flute and horn parts. Once again, they work much better when I can compare and contrast it with the band's unadulterated vision on the first disc. Then we get all seven tracks of One Step Beyond. Unfortunately, this was a substitute Watchband and comes across as somewhat bland late 60's psych folk. It's not an embarrassment by any means, but it commits the sin of being pretty dull. It's strictly C-list stuff, although very competent C-list. Best of all, we get six instrumental tracks that padded out the first two albums. Amusingly, the Watchband had absolutely nothing to do with these tracks- and they very much sound like it. Ed Cobb brought in some pick-up bands like the Yo-Yoz to record some exploitation psych, especially on the Inner Mystique where there wasn't enough Watchband material to finish the album. In a wonderful freak chance, this is some of the best psych exploitation I've heard, easily matching the Zodiac and David Axelrod's work with (as?) the Electric Prunes. It's makes for 20 minutes of some of my favorite guilty pleasure psych rock, garnished with flamboyant fuzz guitar, electronic noise, phasing effects, and of course sitar. This is an amazing compilation that finally brings one of the 60's absolute best garage psych bands into sharp and revealing focus. It also releases the other material from the shame of obscuring the band and gives it a fighting chance of it's own for acknowledgment. In addition, there are some great, informative liner notes, and the remastering throughout is absolutely sparkling. You should buy a copy of this for yourself and a second one for your best music buddy. Judging by the download statistics, a fair amount of this blog's readers at least took a passing interest in the Glaze Of Cathexis recordings. Hopefully you dug it. Here's the other side of the coin. When I'm not in the mood to sing or write lyrics, I delve into the more electronic side of music making. Many of the Damaged Tape tracks I make are used in the microbudget Gonzoriffic films, whose link you'll find further down this page. I use this outlet to work out my Tangerine Dream, Klaus Schulze, Air, Underworld mojo. There's a few accidental David Gilmour impressions in the latter half of the album (or side B if you'll indulge me). The recordings for this album were all made in my little apartment out in Ueda, Japan from October 2006 up until December 2007. The photos in the artwork are from an October voyage to a stone god in the middle of a rice field in Suwa, Nagano, Japan. It's several hundred years old, but has some very Aztec/Mayan looking carvings on it, which is pretty mysterious. Apparently there was an incident where the thing started bleeding from the back after someone tried to quarry a bit of stone from the back of it. Freaky! The best photo from the trip was a double exposure with the god and my Australian buddy Scott. It's so cool that I thought of passing him off as me in the insert, but I decided that would be far too lame. As always, I'd be very happy if some of you other bloggers would be interested in reposting this (I'd like to know about it too, if possible), and I'm happy to hear everyone's comments. If this stuff isn't your bag, the next Glaze Of Gathexis album is a good 60% finished and will show up in a couple of months. And of course we'll continue to hear about plenty of albums here that are not by me.